I have been meaning to get around to my Bob Feller memorial post. Unfortunately holiday travel and parenting responsibilities have taken up much of my time recently and I just have not had the time to think about what I wanted to say about Bob Feller. Of course, I never saw Feller pitch. I grew up in the 1970s long after Feller had retired. 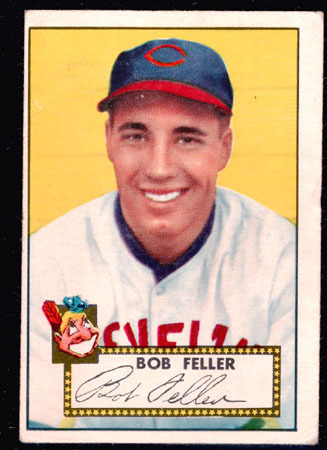 But every kid who played baseball back then regarded Bob Feller as one of the immortals of the game, along with other players from the same era like DiMaggio, Williams, Musial, Greenberg, et al. Among the Feller lore were the opening day no-hitter against the Yanks in 1940 and the speed demonstration with the US Army artillery machine. Every ten year old kid in 1970 knew these legends. When I think about Bob Feller more than anything I think about time. To a generation that grew up with Astroturf and the DH, the era in which Bob Feller played was as distant as the Civil War. We were familiar with the great players from 30s and 40s but, as ten-year olds who possessed only a fuzzy sense of historical time we simply could not look back thirty years and comprehend how close Bob Feller’s era was to our own. If I look back thirty years now to, say, 1980, I recall names likes George Brett, Jack Clark, Steve Carlton, Goose Gossage, Reggie Jackson et al. Far from seeming like another era it feels like only yesterday that I saw these players in action. They are still part of my active memory. To a ten-year old today, however, Steve Carlton is probably as antediluvian as Bob Feller was once for me. Time is funny. It is one thing to a kid and another thing to an adult.